Young researcher Nuwan Nayanajith Kumara’s latest effort to record the biography of cinematographer D.B. Nihalsingha has ended in a huge publication running into over 600 (626 to be exact) pages. ‘Nihalsingha – Purogaami Theveni Esa’ (Nihalsingha – The Pioneer of the Third Eye’) is its title. It is profusely illustrated and written in an easy to read style throwing in technical jargon in between and a heap of new (at least to me) Sinhala terms. What does a reader expect from a biography? As for me, I am basically interested in getting a glimpse of the person’s life story and his or her contribution to whatever field the person is involved in. Nuwan gives much more. Nuwan’s is a long story starting from the time Nihalsingha’s grandfather Diyogu Badathuruge (D.B.) Carolis de Silva born at Kathaluwa, moved over to Tissamaharama, acquired hundreds of acres and became a wealthy landowner. His third son David was Nihalsingha’s father who changed his name to D.B. Dhanapala after he listened to a talk by the great patriot Anagarika Dharmapala in Galle. 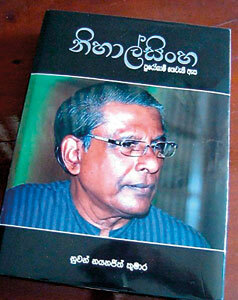 Nuwan devotes the first chapter of the book (208 pages) to renowned journalist Dhanapala’s life story. It is virtually a history of contemporary Sinhala newspapers recollecting the days when Dhanapala moved out of Daily News (his columns under the pseudonym Janus are still talked about) and managed to convince the Times of Ceylon management to start a Sinhala newspaper (Lankadeepa). He was later the architect of several others including a weekly ‘Divanina’ (not to be confused with the current Sinhala daily) with Chatham House, and ‘Dawasa’ and ‘Sawasa’ with M.D. Gunasenas. While getting Nihalsingha to relate interesting tales about the father, Nuwan narrates Nihalsingha’s school and university life alongside. He covers the initial stages of Nihalsingha’s interest in cinematography as well. A large number of names as well as portraits have been used of persons connected with newspapers in Dhanapala’s days but it’s a pity that the reproduction of most of the pictures is of low quality. It could have been much better if they were not used or used in much smaller sizes. It has certainly affected the quality of the publication. The story of Nihalsingha, “the maestro who mastered the art of making wide screen films with hand held camera” begins in the second chapter. Here Nuwan delves into the history of cinema and moves over to cine cameramen. He identifies Leslie Pedris, Willie Blake, Mike Wilson, Lenin Moraes and Sumitta Amarasinghe as five “extra special” cameramen prior to Nihalsingha. He then traces Nihalsingha’s long journey starting with the 16mm Rolex camera he got from filmmaker K. Gunaratnam in 1953. Three years later he started sending news reels to the Australian Broadcasting Corporation. This was his first step towards becoming a professional. After receiving a gift of a 35mm Ariflex camera from his father in 1964, he travelled the length and breadth of Sri Lanka picking material for news reels to be sent to Hearst Metrotone News in USA. The much talked award winning documentary, ‘Bhakti’ was the outcome of his observant eye during these trips. Nuwan writes a long history of the documentary films which allows a student of cinema to quickly grasp the progress of documentaries at a local and international level. Nihalsingha’s service as head of the Government Film Unit and as General Manager of the State Film Corporation is recorded in Chapter 3 from where Nuwan moves on to discuss his pioneering effort in producing the first Sinhala cinemascope film ‘Weli Kathara’. He returns to devote a chapter to “the creator of the golden era” of Sinhala cinema tackling many a thorny issue as Film Corporation’s CEO. The serious researcher has plenty of material here with facts and figures of the rise and decline of a State institution due to wrong direction, inefficiency and mismanagement. Nihalsingha’s extensive study earned him a PhD from the University of South Australia in Adelaide. Nihalsingha’s presence in the field of television, his efforts at making cinematography an interesting subject at university level and his continuous commitment to his profession are well covered in the book. Although there is plenty to read, it’s not the type of biography that can be gone through from beginning to end in a hurry. It needs time. Fast Publishing Limited deserves credit for encouraging the young researcher’s effort. A little more effort in planning would have added to the quality of the final product. I commented on the quality of some of the pictures used. More attention should also have been given to the placement of pictures. Nihalsingha obviously had loads of working stills stretching over five decades. The author had a vast choice. But that does not mean that a publication should be crowded with pictures. The layout in this type of publication needs much more care and professionalism. Then only will its value be enhanced. Nuwan now has sufficient experience in producing texts for studies on his pet theme – the Sinhala cinema and it’s time he takes a more serious look at editing his writings to produce a more meaningful product. It will also be a good idea for him to think of condensed versions of his writings in English so that the English readership will have an opportunity of gaining in-depth knowledge of this art form.